Double Dips depicts a mother purchasing ice cream cones for her three small children. Double Dips copyright © 2002 by G. Harvey is prohibited from being copied. 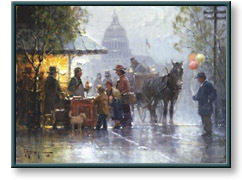 All applicable copyright © laws apply and are reserved by artist G. Harvey.